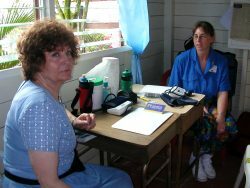 Twenty-one Americans worked in Guyana, South America, under the direction of Partners In Progress, conducting a medical clinic for 4 days at Canal Number Two with the assistance of local Christians from the Clay Brick Road Church of Christ. Six hundred eighty-four patients were examined and treated. 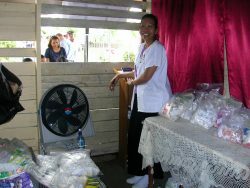 Nearly every patient was taught the Gospel and given religious literature. Hundreds of Bibles were distributed. Maximum attendence at the nightly preaching service was 200. Sixteen people obeyed the Gospel. 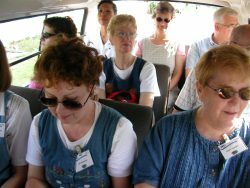 On Saturday, 7 June, 2003, fourteen Christians (including one from Indiana) began arriving at 4:30 a.m. at the Fort Smith airport to start a "vacation with a purpose." We departed on Northwest Airlines around 7:00, about 40 minutes late. We changed planes in Memphis and arrived at Concourse G in Miami at noon. We found that the BWIA check-in counter in Miami has been relocated to the area between Concourse F and G. There we were joined by Christians from Washington, Oklahoma, Missouri, Texas, and Vermont, as well as by Fort Smith newlyweds who had been on their honeymoon in Miami. There was just enough time to get a quick bite to eat before our international flight. Those of us who have flown to Guyana several times were surprised to find our plane was only about one-fourth full. A small meal was served between Miami and Barbados. We remained on the plane during the brief stop in Barbados, where we picked up enough passengers to nearly fill the plane. There was no meal between Barbados and Guyana. The Ministry of Health interviewed each arriving passenger in an apparent attempt to screen for SARS, the currently perceived public health threat. Everyone was pleased that all personal luggage and supplies arrived. (Claim checks were not collected at the airport this year.) We departed the airport before 8:30. Most of the team was asleep by 10 p.m. at the hotel on Saturday night. On Sunday, breakfast was served at 7:30. Two vans departed with our 21 team members at 8:30. We arrived at Clay Brick Road Church of Christ at Canal Number Two about 9. 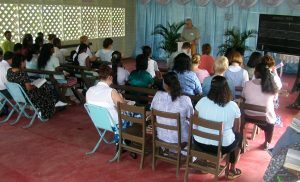 David Rivoire taught the adult Sunday school class in the spacious new building while the children met in the small building, where our team worked last year. The local minister, Harry, preached during the worship assembly. At church we met a young woman from Washington state who is a Peace Corp volunteer at the local government health center at Canal Number Two. We returned to our hotel around noon and enjoyed a nice lunch. Team members spent the afternoon resting and napping. At 5:30 p.m. we were treated to a reception by the hotel management. Supper was served at 6:00. Afterward we sang till the Operation Guyana orientation ("Steve's Rules") began at 7:00. About 9 we divided the Bible teachers from clinic personnel for separate meetings, then adjourned for the night's rest. Monday, 9 June 2003, began with breakfast at 7. Richard Bullard encouraged us with a devotional, reminding us that the power to change hearts is in the Message, not in the eloquence of any messenger. Our vans and supplies left the hotel about 7:45 a.m. We arrived at Canal Number 2 around 8:30. Everything was set up by 9:30 and we began seeing patients. As always with Partners In Progress, the doctor visits, eyeglasses, and medications were completely free to all patients. 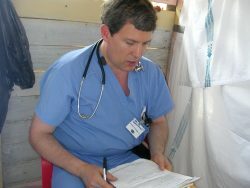 The Bible teachers and nurses worked in the nice, new building, where the tent and mud was in June 2002. 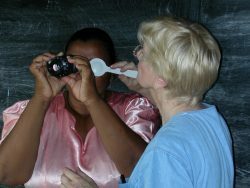 Our doctors, eye technicians, and pharmacy were located in the small, old building which we used last year. We found that a flushing toilet had been installed in the outhouse this year. In spite of several light, tropical showers throughout the day, the temperature reached 87°F on Monday. Generator-powered fans helped us tolerate the heat and humidity. We purposely avoid advertising the free medical clinic in advance of our arrival. Otherwise, we would have a bigger crowd than we could manage. Local church members, obviously, know in advance and invite their family, friends, and neighbors. This provides the service first to those in the community and allows the local church an improved image for those who can best be served by them. Generally, as the week progresses, more and more patients, from greater distances, present themselves at the clinic. By noon of our first day we had distributed 60 numbered tickets for vision care, so sent home all remaining eye patients waiting in line. At 2 p.m. we let in our last remaining medical patient through the gates. Around 2 p.m., four of our American workers went to the local primary school to conduct a Vacation Bible School. We offered to study the Bible with each patient while they waited. On our first day, we treated 100 medical patients and provided vision care for 62 people. Bible tracts were handed to every patient in our clinic. We witnessed 2 baptisms on Monday. Vans returned all workers in mid and late afternoon to our hotel. Supper was served at 5:30. We left the hotel at 6:30 for the evening service at the clinic site. 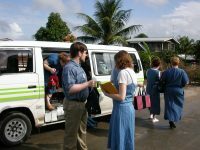 Between 1997 and 2001 we conducted four week-long medical clinics at Bagotville with the Nismes Church of Christ. 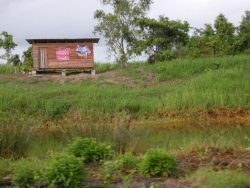 The Nismes church building is on the road between the Demerara River and Canal Number Two. Each evening, Gary & Nancy James were dropped off at Nismes, where he preached for the congregation there. There were 10 attending the first night. At Clay Brick Road we had 94 in attendance on Monday evening as David Rivoire, a preacher from Vermont, spoke. We were back at our hotel before 9 p.m.
On Tuesday, 10 June, we arrived at the clinic site about 8:30 a.m. and began seeing patients by 9. The temperature remained about 83°F throughout the day. There were only a few sprinkles on Tuesday during the clinic hours. We saw 157 patients. One woman and a man were baptized this morning. Before arriving at the clinic, both of them had made their decisions to become Christians. 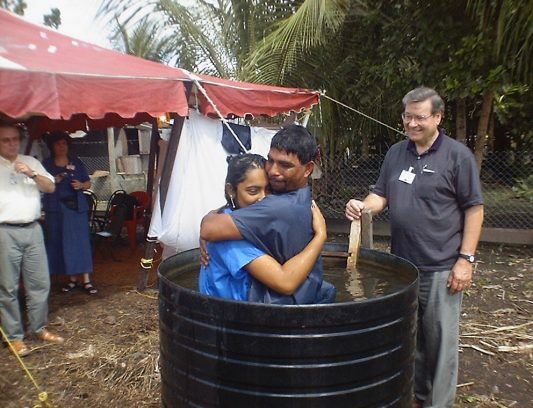 The wife of the baptized man was converted last year during our medical mission at Canal Number Two. We returned about 3 p.m. to our hotel at the Russian Embassy. After supper we returned to the "crusade" at the church building. While our team was away on Tuesday evening, our large shipment of medications arrived from England. The Operation Guyana staff counted, packaged, and labeled thousands of adult multivitamins, acetaminophen, and diabetic drugs to dispense at our clinic. Other pills will be counted and packed by each of several medical mission teams as they arrive in Guyana. We're never able to provide treatment for every illness we see, but our formulary of 28 drugs covers about 95% of the health problems we encounter in our village clinics in Guyana. Though our medications were delivered a few days after our team arrived, we were not hindered from opening our clinic this week. There were adequate quantities of most medicines remaining at the permanent clinic from last year. Having the full formulary is ideal, but often on the mission field things do not go the way we prefer. Missionaries must be adaptable and "go with the flow." 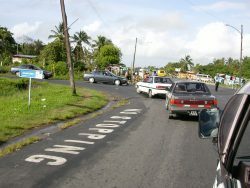 On Wednesday, 11 June 2003, we found a crowd waiting in line at the clinic site. Shortly after getting the generator started, one of our fans began smoking, then quickly was in flames. In less than an hour another fan burst into flames. Fortunately, the problem was quickly recognized so that no person nor property was damaged. In spite of it being the rainy season, there was sunshine all day on Wednesday and usually a pleasant breeze, though the temperature was around 85°F. The story of the Good Samaritan was presented in the afternoon at the public school by members of our team. 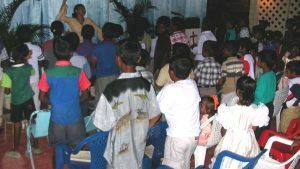 The 300 children were encouraged to bring their parents to the evening service. 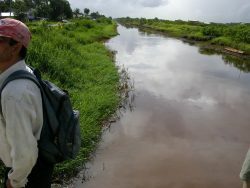 When we reached the Demerara River after leaving the clinic for the afternoon, the bridge was closed to traffic. We sang while we waited about 20 minutes for passage. After returning to our hotel from the crusade Wednesday evening, we enjoyed fresh, sliced, chilled pineapple, which we had brought back that afternoon from the Canal Number Two area. It was sweet and juicy. The center core in the Guyanese pineapple tastes better than the best part of the pineapple that we consume in the States. Upon arriving at the clinic about 8:30 on Thursday morning, we found it was hot and sunny, with very little breeze during the first couple hours. By 10 a.m. the temperature was 87°F. Such weather is poorly tolerated by Americans, spoiled by over a generation of air-conditioned living. It cooled a couple degrees after a short rain shower about 11. A light breeze and a bright sun was soon back with us. Several American workers presented a Bible lesson on Daniel around 2 p.m. at the local primary school. The children enjoyed helping act out the lions' den story. 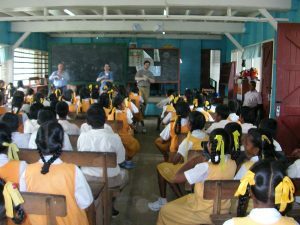 We discovered many years ago in Guyana that our presence in the classrooms increases the evening attendance. We invite the children, who ask their parents to take them to our evening services. At some locations in past years we have had the facilities to move the children to a separate room for Bible teaching during the sermon. This was not possible at Clay Brick Road church. Here the children filled the first few rows at the beginning of each service and were led in several Bible songs by Elizabeth, the local preacher's teenage daughter. The kids sat quietly at the front throughout the rest of the service. When we closed the gate to the clinic for the last time on Thursday, there were no patients waiting to be seen, suggesting that we must have provided care for everyone in the village who wanted to be seen. 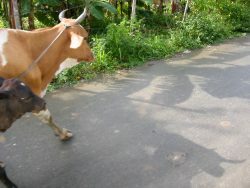 As in many Guyana villages, the people have other options for health care. We encouraged all hypertensive and diabetic patients to regularly visit the medics at their public health center. Shortly before we began packing up on Thursday, one of the new Christians, who had been baptized on Monday, arrived wearing a bloody bandage on his foot. He had cut it with a shovel. Within a few minutes we had his laceration cleaned up and 4 sutures were placed. One of our nurses placed his foot in a bandage. He was instructed how to keep it clean, and his wife was taught how to remove the stitches in 1 week. Our 2 physicians treated 107 other medical patients on Thursday. 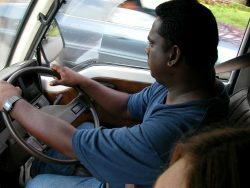 The problems that Guyanese patients have are similar to what we see in our family practice clinics in the States, plus we see many cases of skin fungus and intestinal worms. A high percentage of people have work-related acid reflux and musculoskeletal pain, but their survival depends on the hard manual labor they endure. Finding a less strenuous job is not an option for them. While our supplies were being packed and loaded on Thursday afternoon, Roy Dunavin had a Bible class with the local Christians who had worked with us all week. The local workers were very helpful with many aspects of the Bible teaching and clinic each day. 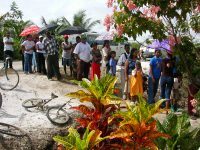 Without their assistance we could not have conducted a medical campaign in their community. 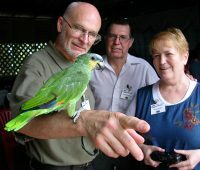 We departed the clinic site at 3:30 p.m. on Thursday and arrived at the hotel at 4:00. We returned to Clay Brick Road before 7 p.m. A bright moon and a starry evening without rain made it very hot and humid at the church building. The Southern Cross constellation, which is not visible in the States, was easily identifiable. Each year we notice progress with the Guyana economy. This year we found that many Guyanese now carry a cell phone. Phones ringing during church services was amazing to hear for us who had been in past years. Most citizens remain in poverty, but they are beginning to be more prosperous. Eyeglasses remain too expensive for the average worker. In 4 days we provided visual testing for 265 men, women, and children. Every person who could be helped were given free eyeglasses. We photographed this couple being baptized during our campaign in 2002. 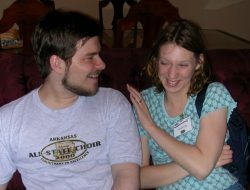 We found them growing spiritually and very active in the church in 2003. 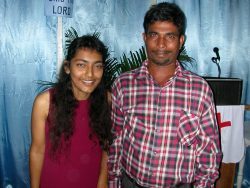 Departing from the Guyanese Christians is an emotional conflict. We are sad to leave them, yet we are eager to return home to our families and friends. Saturday was a day of rest and relaxation for team members to enjoy the beaches, shops, restaurants, touring, etc., of the Caribbean island of Grenada. On Sunday, 15 June 2003, our group met at 5 a.m. in a conference room for a brief devotional and communion service. We were transported the short distance to the airport. We transferred planes in Trinidad, were fed a small meal, and arrived on time in Miami. In spite of a 2-hour layover at the Miami airport, several of us barely got to the departure gate in time due to clearing Immigration, picking up luggage (which seemed slow due to heavy rain), clearing Customs, agricultural x-raying of suitcases, riding elevators upstairs with our luggage, finding the Northwest Airlines check-in counter, getting suitcases x-rayed and opened at TSA security screening, standing in a long line for carry-on and personal security clearance (which included every passenger removing their shoes), then literally running to our plane to get on after the final boarding call. Sixteen of us arrived in Memphis about 25 minutes early. A few in our group were voluntarily bumped to a later flight to Fort Smith. Miraculously, our luggage arrived with us in Fort Smith, even though we barely caught the flight out of Miami ourselves. The trip was one of our best ever. Everyone on the team worked hard. We witnessed the power of the Gospel. All glory belongs to the Lord for our successful work and our safe trip. We're already beginning to plan our June 2004 trip. Richard Bullard, Jeannie Cole, Louise Cole, Michael Cole, M.D., Steven Cole, Joyce Dunavin, R.N., Roy Dunavin, Jane Gregory, Vicki Hardin, Amy Hart, R.Ph., Gary James, Nancy James, Glenda Lewis, Jack Lewis, Robertta Moses, Charlotte Pinedo, David Rivoire, Jill Roberts, Darlyn Smale, Jeannee Wilkerson, R.N., Steven Younger, M.D.